Today I have the opportunity to review Masks, a system neutral RPG supplement written by the authors of gnomestew.com. Masks is perhaps best described as a “must have addition to any GM’s tool kit.” Contained within is 1000 NPCs, categorized by genre, skill set, trait, disposition towards party etc. (The book marking in Masks is really quite extensive and impressive.) No matter your game, or your style as a GM, Masks has a plethora of NPCs you’ll find useful. 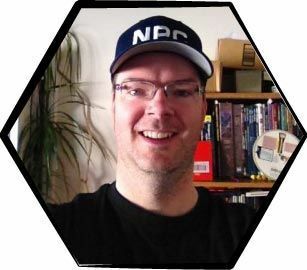 Aside from 1000 NPCs, the book also contains a separate section detailing the finer points of how the NPCs were written up, and giving some points for GMs to use them to the best possible effect within their games. Rounding out this area is a smaller section giving tips on how to portray NPCs in their games and make them truly memorable. Perhaps the best feature of Masks is its layout. The entire book has been extensively indexed, hyperlinked and bookmarked for easy reference, making quick access at the gaming table a breeze. The characters themselves are well detailed, striking a nice balance between providing a GM with all the info necessary to run them on the fly, without overwhelming her with a wall of text. Appearance: Osusk is a short man whose simple clothes have small tears, rips, stains, and burns. His beard is thick and his hair wild. He carries a large knapsack filled with all manner of tools and containers. Roleplaying: He is always thinking about the next great potion or discovery that he will make. He will sniff everything and taste most things, without knowing what they are. He examines everything from every angle. Personality: Osusk has never fit in anywhere, but he doesn’t care. Social cues don’t register with him. Coupled with being direct and curious, Osusk is usually saying or doing something different from everyone else. Motivation: Two factors drive the alchemist: a thirst for knowledge and a weakness for food, wine, and women. Both of these have left him without coin for most of his life. Only by selling what he learns and makes has he survived. Background: Born in the wilderness, Osusk learned quickly that his mind was a better weapon than his brawn. He learned how to make things people wanted from items found in nature; he specializes in brewing potions. He learned that his items fetched a better price in the more civilized lands, so that’s where he sells his wares. Despite doing his best not to act like a barbarian, he sometimes caves to temptation and blows all of his money on wine, women, and food. Such a minor omission is barely noteworthy however, and most GMs can easily glean an NPC’s skill specialties from reading their descriptions and background. In a book of NPCs, perhaps the ugliest part one could hope to find is the selection of vile villains. And in that regard Masks delivers in spades. There are 249 villains throughout the book (83 per genre), ranging from the teenage psychopath who likes bloodlust and fuzzy kittens in equal measure, to a kind and gentle healer who is possessed by a predatory demonic entity. All of the villains contained within are memorable and can be tailored to work as henchmen for a greater evil, or be masterminds in their own right if the GM so desires. While the sheer number of NPCs may seem intimidating to new GMs, finding the perfect candidate for any session is as easy as it is enjoyable; making Masks a super addition to any GM’s toolkit. 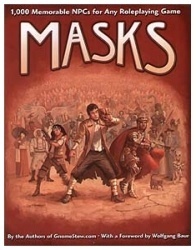 Even those who aren’t GMs will enjoy owning a copy of Masks, as the NPCs contained within make great inspiration to base a PC on, and can provide great allies and adversaries to put in their character’s background story.